Played well from what I saw, although I was watching the rugby more. Good play to win the penalty, I want to see more of those runs from him, that's the Rooney I like to watch... head down, running at opponents and being direct. It's not something we've seen a lot of in recent years but he's done it a couple of times now in recent weeks. He's looking fit and sharp. 1-0 down at the weekend he took the game by the scruff and won a penalty straight away and converted. And again tonight, once they scored he killed the game down the other end the next minute. Hasn't scored for us since the West Ham game he was sent off in. Could do with 1 or 3 at the weekend. Very well taken goal. Before the sending off against West Ham he didn't look like a captain to me for us or England. Since he's come back he has for both club and country, performances have been good too. Another top performance. He's in great form. Hope injury won't keep him out of Tuesday's game. Already missing Di Maria, don't want to lose him too. Key players. We can cope without one I think but not both. They've got a good partnership developing I think. Few of us lads in the pub earlier talking about how they reminded us of Rooney and Ronaldo last week. Read that Di Maria started today well too. He is in terrific form. He is unstoppable at times like these. Hope it's not too serious. Didn't look very serious to me but you never know. Hope he's better next weekend. Really poor tonight. Terrible showing. The way he remonstates with the refs at times doesn't help our cause at all. As captain he should really look at that, some of things he was saying to the ref tonight was disgraceful and I do think it had a negative effect on us towards a few 50/50 decisions at the end. Disappointing performance considering recent form. He struggled to cope with Southampton's pressing tactic and wasn't helped by static movement and little support going forward. Good performance in the box-to-box role. Top finish. The goal is a carbon copy of a drill the team do in the warm up. 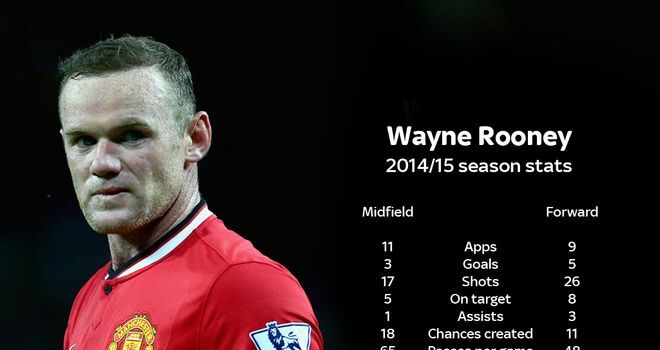 He has scored (66) or assisted (28) 94 goals in his last 100 Premier League games at Old Trafford. When he plays in this role, always feel like there's a goal in it for him. Everyone is running towards goal and he just holds his run and picks up the ball in acres of space. Easy. Decent performance, especially in the first half, but wasted playing so deep. 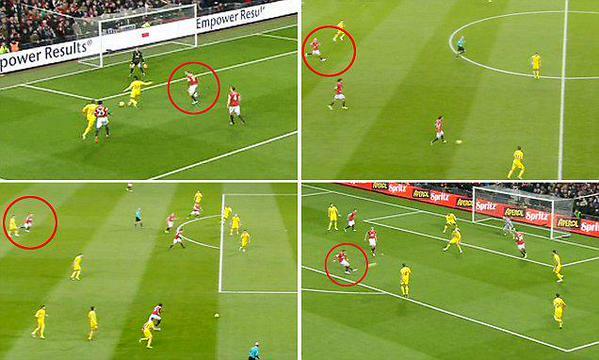 Two quality passes to create opportunities for Van Persie. Goal scoring midfielder! Almost box to box like, fantastic in there. I was surprised by the level of praise after the game if I'm honest. He was good, but I thought his touch and short passing was occasionally sloppy. I'm possibly being unfair. His movement and timing of runs into the penalty area was very good - Scholes-like. Sublime pass to Van Persie. Please can we see him play as a striker. Top pass for Di Maria's goal. One of those days for Rooney. Even after moving upfront he had little impact. What is his best position? I'm not even sure anymore. There are some games, he's outstanding in the #10 role and then others he can be hopeless. I think he's been outstanding in midfield in some games recently, poor last 2 (Yeovil & today) though. He was having to do more defending for first 60 mins and then was the other end of the pitch afterwards. It has to be a problem for him and Van Gaal that he needs him deeper and upfront. I think Di Maria is similar in that respect, would be good to have him on the wing and in midfield, obviously can't do that. I think the 2 of them have linked up excellently at times this season; Leicester, Arsenal, Yeovil are 3 times I particularly remember. Diamond - Rooney upfront in a 2 with Di Maria playing behind the front 2? 4-2-3-1/4-3-3 - Rooney as #9 with Di Maria as the attacking midfielder in a 3? but then who is either side of Rooney? Both players wasted out wide. Januzaj and/or Mata? Valencia? We'd surely need to add to our wing options to go for this. I think 4-3-3 is the goal, it's Van Gaal's formation, the fact we've not used it suggests he's not happy with the squad. From the bits I did see today he was playing even deeper. Thought it was a typical 'Rooney after a rest' performance when in possession. Thought he needed a rest mind having played a lot over December/January. Now he's had that bit of rest hopefully he can kick on now and get his sharpness back up. Agree on him playing very deep, picking the ball up between the 2 centre halves at times but then at other times he was quite high up, switching positions with Di Maria. He was very poor in the first half. He needs to play as a #10 or striker. Awful again, he shouldn't be shoehorned somewhere just because he's captain. He's simply not a midfielder, although he was still one of our better players. His form was excellent prior to the change of roles. How to solve a problem like Rooney? Great player without a best position anymore it seems. Started season upfront in a 2, Van Gaal didn't like him there so dropped him back behind the 2 strikers and Van Gaal didn't like him there either. He can't possibly prefer him as a CM to playing further forward though so where is his best position? He's in the team as captain right now, he's not getting selected on performances. A 5 out of 10 performance tonight. Didn't do much wrong but was nothing special too. His defensive work was good. Rooney as a DM was baffling and not very good but it seemed to calm the 2 CB's having him there I thought. He'll be in defence soon, but he wouldn't be worse than Evans. If it wasn't for the captaincy he wouldn't be very happy about his situation. Playing Rooney as the defensive/holding midfielder is one of the more bizarre things I've seen in football. Fairly average performance. His movement and mobility was an improvement on Van Persie and Falcao.